Now that we’re clearly heading into winter, it’s a great time to think about what kind of safety gear you carry in your vehicle. Granted, you should do this year-round, but winter is a really important time to build a car emergency kit or simply restock your inventory. Do You Carry Supplies in Your Vehicle? Most of us are aware of the importance of bringing safety and survival gear on hikes and overnight trips, but what about in your vehicle? There are a number of scenarios that could leave you stranded or delayed both in the city and outdoors. I’ve blown a tire in the middle of nowhere, helped others fix flats, been blocked by a random fallen tree and an unexpected road washout, and simply gotten lost. Especially in the winter, it’s not uncommon to be stuck at mountain passes due to bad conditions or road closures. A small sampling of some of the gear I keep stashed in a plastic bin in my Jeep. General vehicle safety and repair items. Optional extras. After all, there’s nothing wrong with turning an unplanned overnight into a fun adventure! Dead batteries, flat tires, and other mechanicals can happen whether you’re on forest roads or in the city. It’s always a good idea to have the following items in your vehicle regardless of your destination. You should also know how to change a flat tire and jump start a car. Need a refresher? Your vehicle manual should provide step-by-step instructions (a good reason to have one!) and I’ve also shared some videos and instructions at the bottom of this article. *If you’re a small person like me, consider finding a hollow pipe, often called a cheater bar, that you can slip over your lug wrench to give you extra leverage for stubborn lug nuts. It also doubles as a weapon… which hopefully you’ll never need. **Duct tape is always handy, but for a vehicle emergency kit I highly recommend Rescue Tape. It can insulate up to 8,000 volts, handle temperatures up to 500F, and survive intact to 950 PSI. That makes it very versatile for things like radiator repairs, muffler repairs, and all sorts of stuff you can’t even think of. It also doesn’t leave a sticky mess because it only sticks to itself! When heading out for a road trip or into inclement weather, challenging terrain, or remote areas with a high risk of the unexpected, consider what sort of things can keep you warm, dry, and safe. If you’re on a camping or backpacking trip, you might already have some of this with you. 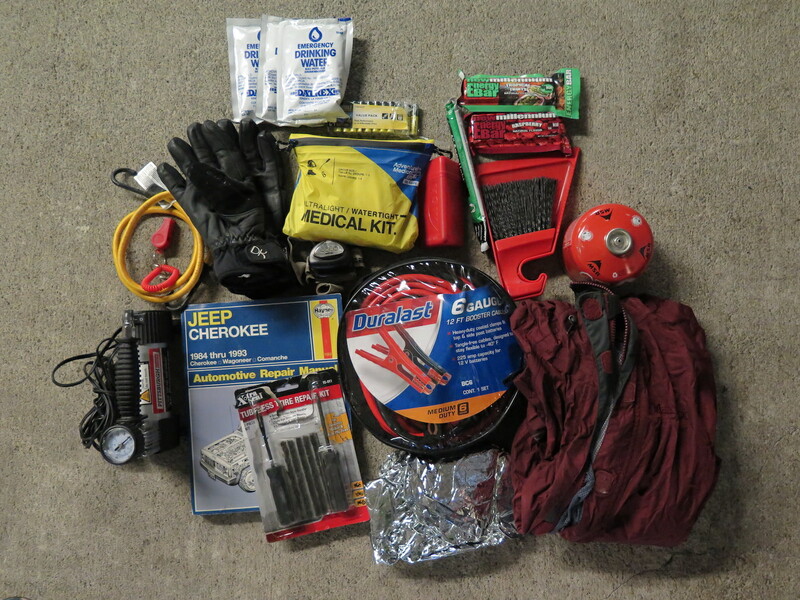 I store these items in a plastic bin that I can quickly toss into my Jeep whenever I’m headed out on road trips or adventures. Consider buying a basic one and supplementing it with extras or build your own. I keep a small Adventure Medical Kit in my Jeep along with extra Benadryl and a SAM splint. Make sure your batteries are the right size for whatever you have (flashlight, headlamp, etc). Pack weather-proof matches, a fire starter like the MSR Strike Igniter or firestarter blocks or bricks of your choice. Space blanket or emergency bivy. I’ve owned a Space All Weather Blanket for several years and love it! Much stronger than the fragile space blankets, use it as an emergency blanket, survival shelter, ground cover, or sleeping bag. These little hand warmer packs are the BEST. Stuff them into your shoes, gloves, jacket, or just about anywhere! I keep a stash in my car. Extra water or water treatment supplies. I usually have a gallon of water floating around in my Jeep but if you don’t have the room, consider iodine tablets or a small water filter. Consider high-calorie easy-to-eat food with a long shelf life that isn’t prone to melting like jerky, trail mix, cereal, tuna, or nuts. I carry a pair of sweat pants, a t-shirt, sweatshirt, pair of socks, old rain jacket, and hat. Stash a $20 in your car! Never know when it might come in handy. Ok, I admit that some of these are useful, and some are simply frivolous and over the top. But hey, having fun is part of the adventure! If you frequently take road trips, travel in rough places, head out solo, and/or have lots of space in your vehicle for extras, the following items can certainly make a trip more enjoyable! Everyone who knows me knows how much I love food so it’s no surprise I carry an extra canister of fuel, an MSR Pocket Rocket, a few dehydrated meals, and Lipton chicken soup mix in my Jeep. If I get stranded I’m eating like a queen! Air compressor and tire patch kit. Buying a portable air compressor for my Jeep has been a great purchase! Mine retails for $29.99 from Harbor Freight, packs up small, plugs into a cigarette lighter, and will fully pump up a flat tire in about 10-15 minutes. Combined with a $4.99 tire patch kit, you can quickly and easily fix small tire punctures. Antigravity Batteries makes a remarkably small charger that will fit right under your seat or in your glovebox and not only jump starts cars, trucks, motorcycles and ATVs but will charge laptops as well as 12V and USB devices. Chances are you’ll never use one, but… you never know. They’re small and one of life’s little luxuries! REI makes great packable camp towels or you can buy a few cheap Walgreens $2.99 beach towels. Having some kind of cutting tool when venturing off the beaten path isn’t a bad idea. Some great options are the Ultimate Survival ParaHatchet, which also has a cord, firestarter and multisize hex wrenches, or a pocket chainsaw. Pencil or pen and paper. Writing a note is sometimes a pretty handy thing! Own a dog who frequently travels with you? Consider packing a little stash of food for them as well! You may think “wow, that’s a lot of stuff!” but the general vehicle repair items as well as safety and survival gear don’t take up that much room and can make a big difference if you find yourself in a jam. Some of you might remember my fun trip to Goldmyer Hot Springs in January 2015 when I got stranded with friends due to catastrophic road flooding. We hadn’t packed for an overnight adventure so I sure was happy about the food, lights, and gear stashed in my Jeep that kept us warm, dry and happy. The extra mini-champagne bottles from my New Year’s climb on Mt. St. Helens sure didn’t hurt either! 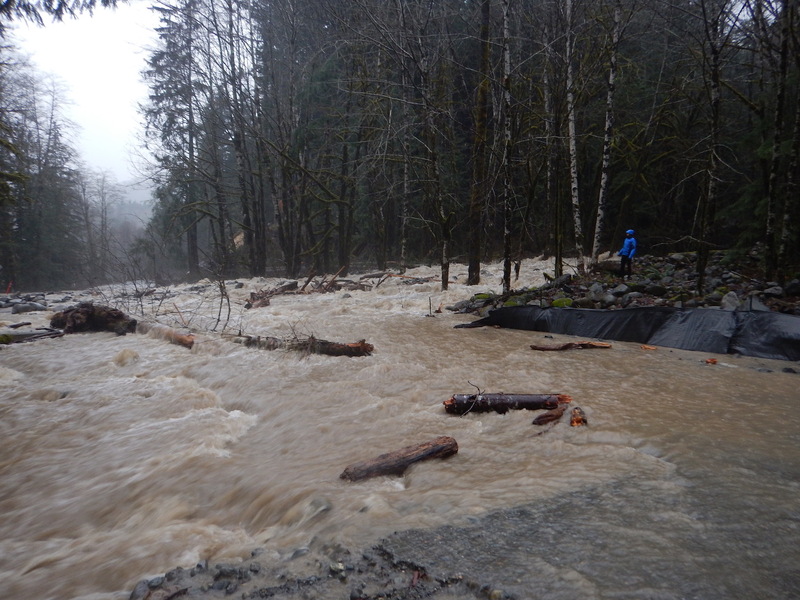 This washout on the Middle Fork Road in January 2015 taught me that having extra supplies in your vehicle is a very, very good thing! We spent nearly 24 hours stranded before we were finally able to walk out the next day but we had lots of gear to stay warm, dry, and fed. I wasn’t able to rescue my Jeep until a week later. Just like the 10 essentials, most of the time you will probably use only a fraction of these things, but the one time you need them, you’ll be happy you planned ahead! Remember that we all take personal responsibility for our own safety and preparedness. Planning now means we’re a lot more capable of helping ourselves when something truly unexpected happens and being self-sufficient makes rescuers’ jobs much easier and less urgent should you ever need them. Happy adventuring and happy new year! Need to brush up on the 10 essentials and other general outdoor safety tips? Check out Seattle Mountain Rescue’s safety page for great information and resources. Need a refresher on how to jump start a car?